[…] Lovano and Douglas dramatically commenced their set on the tight stage in the wedge shaped corner of this tiny, hallowed venue, with contrapuntal, antiphonal, unaccompanied horns. The two leaders alternated original compositions with settings of Wayne Shorter classics (a Douglas arrangement of ‘Fe-Fi-Fo-Fum’ and Lovano’s recasting of ‘Juju’) starting with the trumpeter’s ‘Dream State’ – the lead-off track from their recommended recent release Scandal. 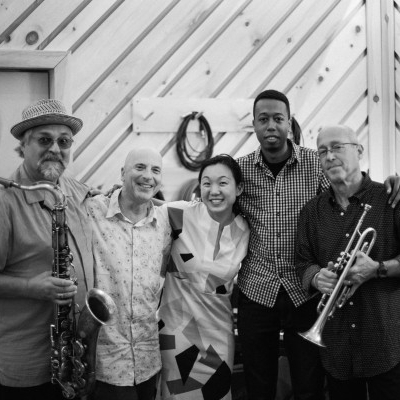 Counterweighting the lines of trumpet and straight tenor were a consistent feature of the intensely interwoven music which was stoked with relevance and energy by the redoubtable Joey Baron, one of the most valuable jazz drummers since Billy Higgins. Also superb was the insistent timing, rich tone and concentrated ideas of bassist Linda May Han Oh, who had picked up the gong for bassist of the year at the Jazz Journalists’ Awards a couple of hours earlier.